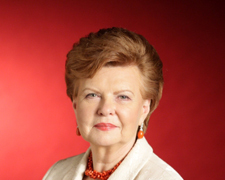 Dr. Vaira Vike-Freiberga is a distinguished academic and, from 1999 to 2007, was the President of Latvia. Born in Riga, she was brought up in Latvia, Germany, Morocco and Canada, where she earned a PhD in experimental psychol-ogy at McGill University in Montreal in 1965. Following a professional career at the Department of Psychology at the University of Montreal, she returned to Latvia, where she became the country’s President in 1999. Dr. Vike-Freiberga has held several prominent positions in na-tional and international scientific and scholarly organisations. She has been awarded 37 Orders of Merit and 16 Honorary Doctorates and has also been a recipient of many medals, prizes and honours for distinguished work in the humanities and social sciences. Speaking Latvian, English, French, German and Spanish Dr. VIke-Freiberga is very active in international politics and contin-ues to speak up in defence of liberty, equality and social justice. She was appointed Special Envoy to the Secretary General on United Nations reform and was official candidate for UN Secre-tary General in 2006. She is also a founding member of the Club of Madrid, a member of the European Council on Foreign Relations, and honorary pa-tron of several Foundations. Since December 2007, she has been vice-chair of the Reflection group on the long term future of the European Union.